From NC Hwy. 16 and Jumpingoff Rocks at milepost 261 to US Hwy. 221 and Beacon Heights at milepost 305, this popular section of the Blue Ridge Parkway continues south along the Blue Ridge. There are several well-known High Country towns along this section - including Boone and Blowing Rock - and several popular recreation areas and hiking trails can be found as well. Grandfather Mountain as seen from the Beacon Heights overlook on the Blue Ridge Parkway, at the peak of fall color. 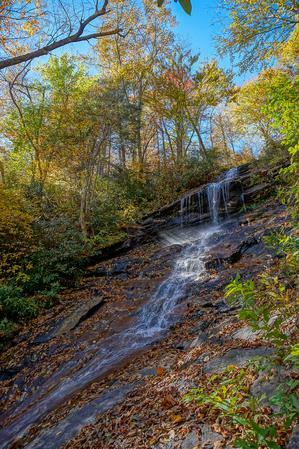 The upper part of Cascades Falls is a short free-fall followed by a steep slide. The falls continues down below this point, but that part is difficult to see. This is the segment of the Parkway that skirts Grandfather Mountain, offering numerous opportunities for hiking onto neighboring lands. The terminus of this section, the Linn Cove Viaduct, is an engineering feat - a first of its kind. On the Viaduct, the Parkway winds around the high, rocky slopes of Grandfather Mountain (the highest mountain on the Blue Ridge at 5964'). The challenge for Parkway designers was to figure out how to cross a particularly fragile, sensitive habitat on this mountain without destroying it for a roadbed. The solution: a long, gracefully curving structure which spans giant boulders and soars above the treetops, built from the top down! The North Carolina Mountains to Sea Trail parallels the parkway along most of this section and provides a number of its hiking opportunities. 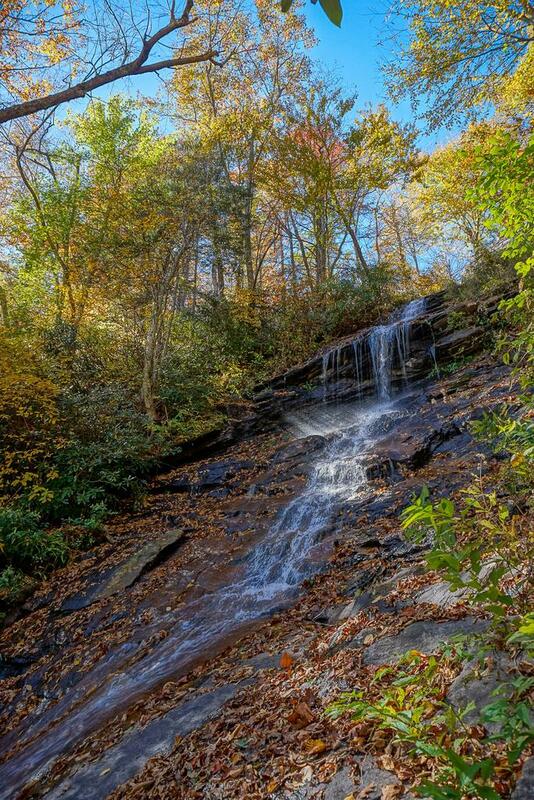 The Cascades Falls* trail, a short loop hike to a pretty waterfall that spills off the Blue Ridge. This connects to the **Tompkins Knob trail to provide a longer hike option from the same parking area. Both are at least partly co-signed with the Mountains to Sea Trail. Another great trail, the Tanawah Trail, travels along and under the Viaduct and along the slopes of Grandfather Mountain. It's one of the finest hiking opportunities in the state. It is co-signed with the Mountains to Sea Trail along its length. The Tanawha Trail connects to several trails in Grandfather Mountain State Park, providing a free way to explore one of North Carolina's most popular and recognizable landmark peaks. This is just a partial list of the trails in this area. For all the details, visit the Blue Ridge Parkway Section 2 Trails page. Here are the developed recreation areas along this section of the Parkway. Unique perspective of marvelously engineered structure which marks the final section of the Parkway to be completed. 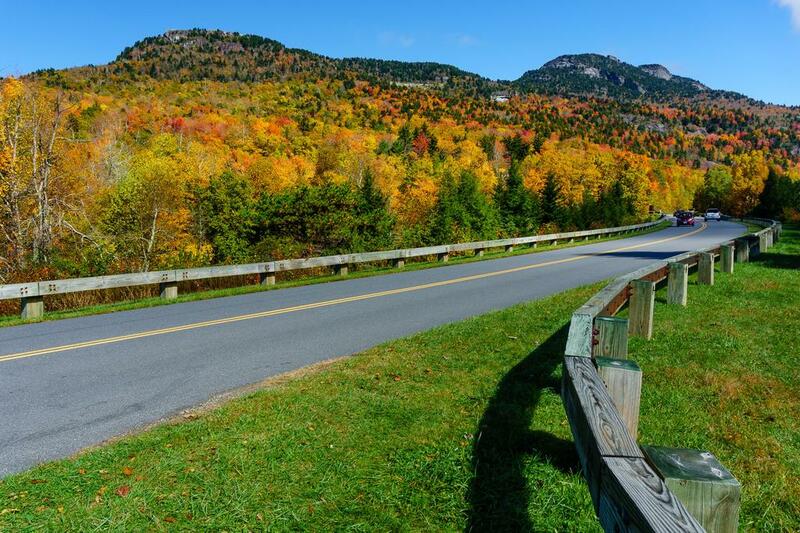 The attraction side of Grandfather Mountain is one of North Carolina's most beloved and well-known tourism destinations. It's located just off the Parkway at the southern end of this section of the Parkway. A Plus Mountain Rentals offers 45 of the Blue Ridge Mountains' most luxurious vacation rental cabins. We can sleep from 12 to 200 guests comfortably. Rates range from $99-$1000/night & $400-$5000/week.